We have TARGET FIELD TICKETS for sale right now! Reserve your spot at Target Field to watch the Twins make a run at a Division Championship and the World Series! Buy Twins tickets between the bases or sit in outfield and catch a homerun. Be a part of this Minnesota Twins season! We hope to see you at the ballpark. Twins 2013 Year In Review - Will 2014 be better? Our Minnesota Twins Tickets are guaranteed. We are a local Minnesota ticket company and we appreciate Minnesota Twins fans. We have cheap Minnesota Twins tickets with many games starting at $5. We have Twins baseball tickets in nearly every section of the Target Field Stadium. Enjoy a luxury Twins experience with seats directly behind home plate in the Champions Club or enjoy a suite like experience with seats in the Legends Club. Prefer to sit by the dugout, we have great Target Field Dugout Box seats too. Only have a few dollars to spend? That's Ok. 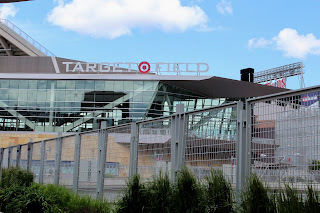 The outfield and upper deck seats at Target Field are affordable and provide a great Twins baseball experience. We appreciate your business and hope to see you at the ballpark.